Much attention has been given to the glittering gold and garnet work of the Staffordshire Hoard, but often, plainer items can be much more informative. sth711 (nicknamed 'Dave' by conservators) is a fine example of this, foregoing gemstones in favour of fascinating images in cast relief. What are the meanings of these images, and what can they tell us about the history of this piece, the hoard itself, and the people who buried it? Nb. Observations herein are based on photographs and are intended to encourage debate. It is likely many of these observations have already been made by the team of conservators and historians working on the hoard, but given that, so far, little detailed analysis has been published for public perusal, hopefully this article will help encourage public interest in close analysis of the finds. sth711, also known as k711 is one of a handful of items not made of gold or silver, but of copper alloy . However, small glittering areas in the less exposed parts of the piece hint that this was probably originally plated with a precious metal, most of which has been worn away. sth711 conforms to the typical size and shape of pommel-caps which adorned Germanic swords during the Migration period  (for information on their use, click here). On one side, the piece displays a rather intriguing face or mask, surrounded by oddly stylised arms that may also represent beasts. The identity of the bearded man depicted is unknown, but a deity would seem logical; the presence of such a depiction providing apotropaic protection for the sword's owner. Though both eyes are present, one pupil appears to be absent, suggesting that eye is blind, consistent with the god Woden. 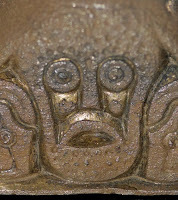 Such depictions are rare, and the style of this depiction seems quite distinct from other Anglo-Saxon depictions of Woden such as the Finglesham Buckle, in terms of face-shape and the features emphasised. The other side of the pommel-cap is rather more fascinating. At the top of the pommel cap are two birds, that may be depictions of the ravens of Woden, Huginn and Muninn mentioned in the Eddas . Within the design of the arms beneath, an additional two bird heads are contained. The first figures that ones attention is drawn to, however, are two boar heads facing toward the corners. Depictions of boars are also thought to have an apotropaic quality, and are found on various Anglo-Saxon finds, not least the most significant find from Mercia other than the hoard; the Benty Grange helmet. Boars are associated with the god Frey-Ing  ,and it is probable that such depictions would've been thought to afford the bearer his protection. In some ways the appearance of boar imagery in the hoard is not surprising. Boars depictions frequently pop up in the archaeological record and we know that boar emblems were favoured by the Mercians. 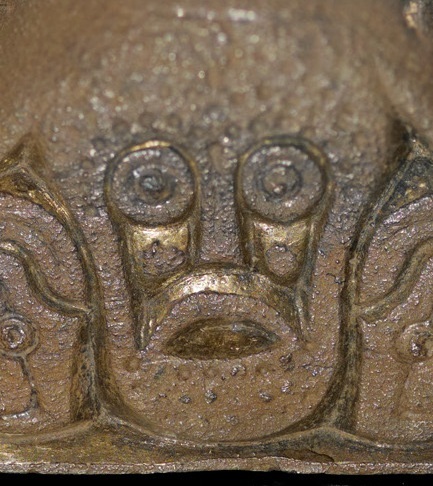 However, the precise boar-head arrangement closely resembles the enigmatic but strikingly beautiful gold-and-garnet pommel from Hög-Edsten in western Sweden , itself the subject of much academic debate. 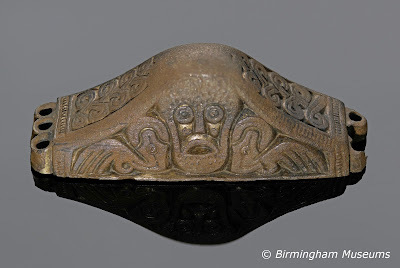 Could this indicate cultural and trade links between Geatland -the land of Beowulf, and the kingdom of Mercia, during the time this pommel--cap was made? 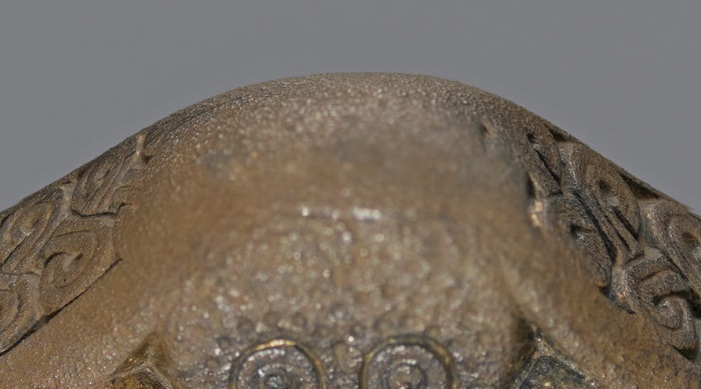 The dating of this pommel-cap is fascinating. Comparative dating may not be a lot of use, as very few finds in this precise style have been found, and the closest approximate- Hög-Edsten, is not confidently dated either. 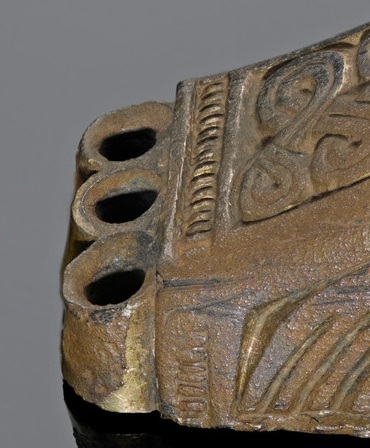 The interlace adorning the top of the piece has been noted to resemble that of an Alemannic pommel from Schretzheim grave 366 , though it's not clear how significant this resemblance might be. The main images present (disembodied animal body-parts) are consistent with Salin Style-1 thought to have been gradually replaced by more heavily stylised Style-2 during the 6th century. Given most items in the hoard are dated to the 7th to early 8th century , sth711 is something quite special. It may be hundreds of years older than the rest of the hoard; a historical artifact even before it was buried. There's far more that is peculiar about this piece, though. First, it's apex has seen its 2+ mm deep relief completely rubbed away. It's fair to say that the top third of the pommel cap has lost all it's decoration to wear and tear. This contrasts strongly with most other items in the hoard which, though made from softer materials, do not display this kind of damage. They are mangled and bent from detachment, yes, but for the most part, they were not subject to decades or centuries of wear before they were put in the ground. We think of these items as being fairly disposable; what was fashionable in the world of sword decoration changed with time, and there is substantial evidence that swords were re-hilted to accommodate new decoration. The amount of wear on the apex of sth711 is indicative not just of age, though, but of decades or centuries of constant use; it would take many years of clothing rubbing on the apex for such wear to accumulate. By the time of the Staffordshire Hoard's deposition, this piece would've seemed old fashioned, even archaic, yet the wear (combined with its early dating) suggests it might have remained in use until a relatively short time before it was deposited. Did this piece, or the weapon it was attached to have special meaning or significance to the line of people who possessed it? Another peculiarity of this piece is that it clearly had six sturdy attachments for pins, rather than the usual four. Such pins were used to attach pommel-caps to the upper guard, penetrating through the upper plate and into the organic material in the middle of the sandwich. While later pommel-caps were attached with only two pins, or none at all (held on by the peening of a protruding tang) I know of no cases of a sword pommels being secured by six pins outside of the Staffordshire Hoard . Perhaps this was an earlier approach used before smiths discovered only four pins were really necessary? The attachments are not intact, however. In fact, on one side, two are broken away, and the third on that side seems to be flatter than its opposites. In addition, next to the broken pin-holes is a dent in the side of the pommel-cap. The damage to the holes and the corner could be the result of a particularly tricky detachment, but sth711 is made of hard copper alloy and one of the few pommel-caps on the hoard that's relatively sturdily constructed. Though the aforementioned hypothesis is certainly a possibility, a rather more exciting proposition might be that this "damage" was the result of work to make the cap compatible with a ring-attachment. 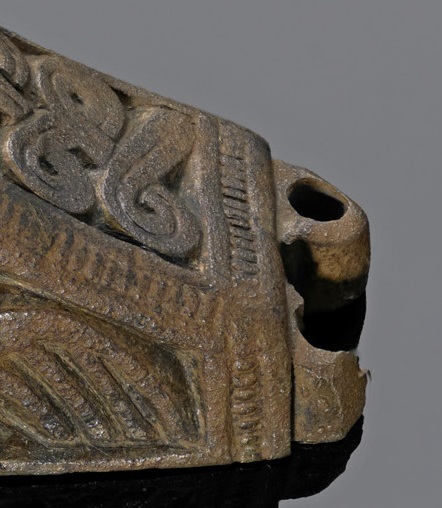 The two aspects of the apparent damage very closely resemble the Snösbäck pommel from Västergötland, Sweden (roughly 100 miles from the site of the Hög-Edsten find)  thought to have been sawn or filed down to accommodate a ring which was later removed. If the pommel-cap sth711 was indeed adapted to accommodate a ring attachment, this would support the early dating, as the piece certainly was not originally intended to be part of such an assembly. Whether such work was done in Scandinavia or in England, we will perhaps never know. Its close resemblance to Scandinavian (particularly west Swedish / Geatish) finds cannot be ignored, nor its notable dissimilarity to other finds from England. If it was indeed crafted in Scandinavia, when in its long life did it find it's way to Mercia? Was the sword of sth711 a gift from a northern thegn or king, or might it have travelled to Britain from northern Europe during the migration of the 5th and 6th centuries? What we can be sure of is that sth711 sits among the most interesting finds of the hoard, and with it's early date, represents a period of history from which archaeological finds in England are fairly thin on the ground. (1) Birmingham Museums. Images of the Staffordshire Hoard. [Online] Available from: http://www.staffordshirehoard.org.uk/ [Accessed 2012]. (2) Thompson A. Anglo-Saxon Sword Words. [Online] Available from: http://thethegns.blogspot.co.uk/2011/11/anglo-saxon-sword-words.html [Accessed 2012]. (3) Thompson A. The Raven. [Online] Available from: http://thethegns.blogspot.co.uk/2012/03/raven.html [Accessed 2012]. (4) Thompson A. The Boar. [Online] Available from: http://thethegns.blogspot.co.uk/2012/04/boar.html. (5) Neilsen KH. Style II and all that: the potential of the hoard for statistical study of chronology and geographical distributions. The Staffordshire Hoard Symposium 2010. (6) Eriksson T. Iron-Age Curator of the National Historical Museum of Sweden - Concerning the Hog-Edsten Find. (Personal communication). (7) Fischer S, Soulat J. The Typochronology of Sword Pommels from the Staffordshire Hoard. The Staffordshire Hoard Symposium 2010. (8) Mortimer P. Concering 6-Pin Pommelcaps (Personal communication).